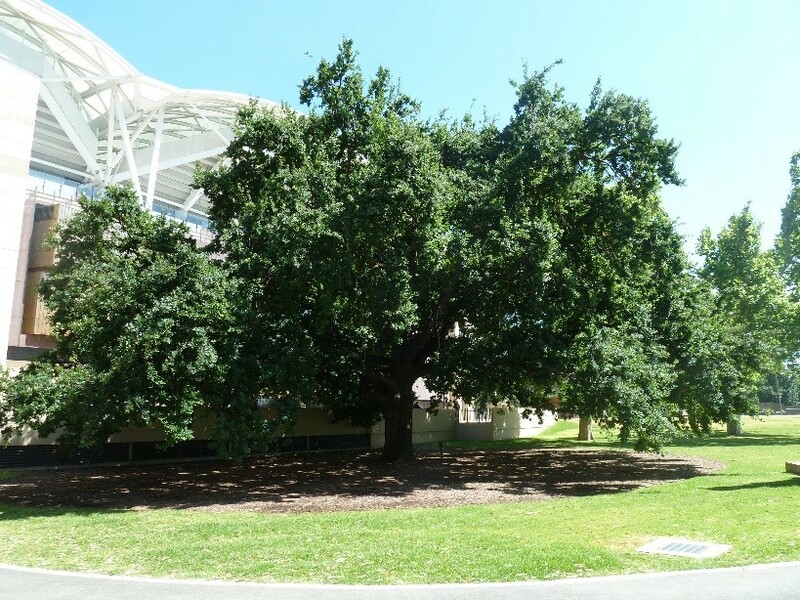 Nestled beneath the East Gate entrance to the Adelaide Oval there stands a magnificent English Oak (Quercus robur). Given its setting between the Oval and Creswell Gardens, many hundreds of thousands people would have passed this tree mostly likely without noticing it let alone being cognisant of its significance. The Oak’s significance is recorded on the South Australian Heritage Register, Place No: 26348; and it is also recorded on the National Trust of South Australia’s Register of Significant Trees ID No: 727. 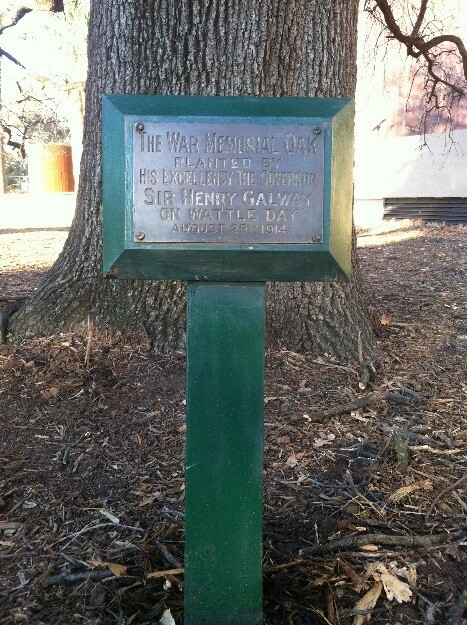 Known as the ‘War Memorial Oak’ it is considered to be of national importance for it is recognised as the first memorial tree to be planted for the Great War by any of the countries involved. A mere 25 days after Britain declared war on Germany the Governor of South Australia, His Excellency Sir Henry Galway, in the company of Lady Galway and many other dignitaries gathered to plant this tree on 29 August 1914. Eight wattles were also planted by the attending dignitaries to recognise the states and territories forming the Commonwealth of Australia. This patriotic event took place as part of Wattle Day celebrations and was devised by passionate champions associated with the South Australian Branches of the Australian Natives Association and the Federal Wattle Day League. Though the wattles no longer exist, the original brass plaque continues to quietly state the tree’s significance. 1928 photograph of the Sir Ross Smith statue in Creswell Gardens. Note the War Memorial Oak (Quercus robur) tree with plaque to the left rear of the statue. Perhaps 500 years hence— although some of them probably would not be there— (laughter) — the children would gather on Wattle Day under the shadow of the great oak tree and read the suggestive lines placed there by their predecessors. And their patriotism would be fired as they thought of the deeds that Britons had done in years gone by. (Applause.) The oak which was to be planted was, like Australia, young. An older tree was not chosen because they sought to convey the idea that this oak in its infancy was synonymous with the beginning of the great cataclysm in Europe. The commemoration of the war dead following the Great War provided the largest and most comprehensive acknowledgement of the cost of the war in terms of human life and the scale of the sacrifice made by individuals, families, communities, regions and nations. Memorials and monuments of stone and bronze are certainly an enduring part of Australia’s military commemorative landscape. The convention of trees as war memorials, planted in various configurations as individual specimens, small groups and groves, around objects, single rows, or avenues, is not peculiar to Australia. Despite the pomp and ceremony and the intent of the aforementioned occasion, it could not have been imagined that tree planting activity specifically to commemorate military service and sacrifice, would explode throughout the newly formed nation. The epicentre of this activity was located in regional and rural Victoria and New South Wales, soon after the commencement of hostilities commenced and gathered momentum with each life lost. It seems that ‘avenues of honour’ as a collective term used for commemorative plantings are peculiarly Australian. 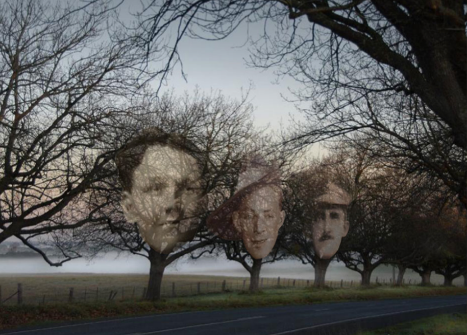 The loss of life in the Great War and in many cases the years following it, resulted in a proliferation of memorial trees being planted and this uniquely Australian tradition persisted through and beyond WW2 and continues to this very day. It is reasonable to appreciate the primary function of trees as ‘living’ memorials was to perpetuate the memory of service and sacrifice for future generations by keeping ‘green’ or ‘alive’ this memory and history. This is may be especially attributed to Australia’s remoteness from the theatre of war; a time when bodies of the fallen were unable to be repatriated and the graves out of reach. The planting of trees provided a tangible connection to the loss of loved ones and mates. For many the planting of a tree was both a private marking of a personal loss and public acknowledgement of the loss to the community as a whole. The nurturing of a tree to remember a loved one made it far more accessible for families than any alternative and is therefore probably the most personal and meaningful tribute amongst all forms of commemoration for the fallen. Given a supportive environment trees will flourish and of course are quite inter-generational. 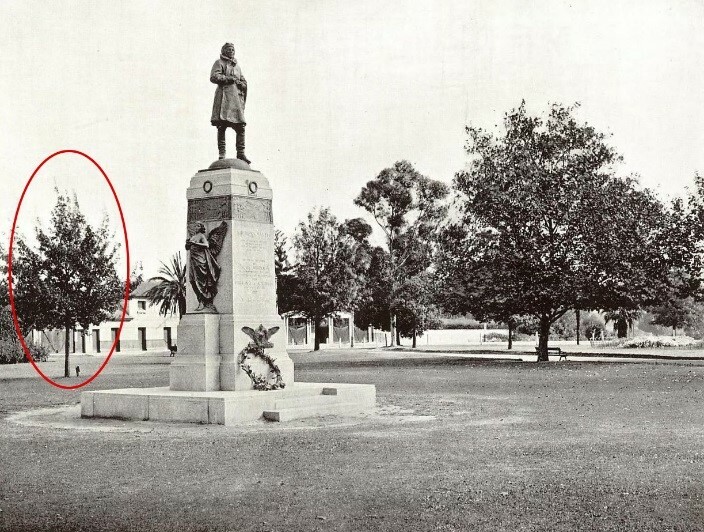 The commemorative selection of the Gallipoli Oak or the Lone Pine to draw a specific connection to the battlefield and key conflicts has a broader, national focus, as was the pre-emptive case with Adelaide’s War Memorial Oak. Both trees also offer longevity and resilience – the latter being important given the Australian climate. It would be fair to say that over the passage of time, any type of civic memorial for any purpose can fade into the landscape and remain oblivious to the general passer-by. This certainly can be attributed to trees in the public and private realm, for it is a standard convention to have trees in parks and gardens and lining roadways and streets. Unless there is attention drawn to other significance attached to such trees, they will be simply taken for granted. TREENET’S Avenues of Honour Project, launched in 2004, made a concerted effort to ensure such memorial plantings would be elevated in the public consciousness so they would be regarded as being more special than your everyday tree; and to be afforded the long-term care and respect they deserve. It is clear that every commemorative planting has its own story, be it of campaigns, battalions, communities or individuals and these stories are as important to preserve as the trees that shape them. The continuing, major task of this project is to gather these stories, promote them, and make them freely and readily accessible. The key mission of this ambitious project is to confirm that war memorial plantings, are not just about the trees: that more importantly these Avenues honour the memory of those who served and lost their lives on our behalf. Research has revealed that ignorance, neglect and the pressures of development over time have devastated many of these living memorials. The aspirational outcome is to ensure the memory of every individual who has made the supreme sacrifice, is honoured with a tree. To that end, TREENET’s Avenues of Honour Project is dedicated to documenting, preserving, reinstating and encouraging the establishment of new commemorative plantings, the ‘Avenues’. TREENET’s commitment with community support is to ensure their care and not to let our service men and women die twice.